For 36 years, The Destin Seafood Festival has celebrated fresh local seafood, live music, local art and generations of family memories. Every October, The Destin harbor hosts a tradition that first started with nine women of The Destin Charter Boat Association Women’s Auxiliary. These pioneers started selling homemade gumbo, fried fish and beer from a pickup truck to raise money for the fishing fleets endeavors and has now grown to over 100 artists and three days of live music. Staying true to it’s roots, the festival showcases fresh local seafood from many local restaurants. All music and art aficionados can savor unique local and international talent, kicking off Friday with New Orleans style Village Brass Band on the HarborWalk Village Stage and stirring things up with the Sauce Boss cooking his famous gumbo while playing steel guitar and top off the night with four hot Aussie’s tearing it up for the first time at the festival, Australia’s LongReef takes the stage at 8:00 PM followed by fireworks over the Destin Harbor! Taste a slice of Americana as The Modern Eldorados serve up a heaping of honky tonk and rockabilly on Saturday and southern country rock from Leah Seawright, making the harbor come alive with music that feeds the soul. Enjoy gulf seafood right off the docks on Destin Harbor Boardwalk, caught locally and cooked to perfection. Locally owned and operated Harry T’s Lighthouse, Crab Island Cantina, Jackacudas Seafood and Sushi will be offering everything from bushwackers to margarita’s from tacos to sushi. Dan Empson, owner of Harry T’s Lighthouse, donates proceeds from the festival every year to the Destin Fishing Museum. Adventure seekers can view the festival from another level this year, riding the Emerald Coast’s longest zip-line or free fall 100 feet into the action. Experience the thrill of a runaway mine or fighting zombies at the Ultimate 7D movie theater on the harborview level of HarborWalk Village. Live acts Friday, Saturday and Sunday on multiple stages, cocktail bars serving libations to go, hundreds of artists and local culinary offerings from sushi to seafood tacos, all combine to make this year’s seafood festival a colorful celebration of living life on the beautiful Destin Harbor. 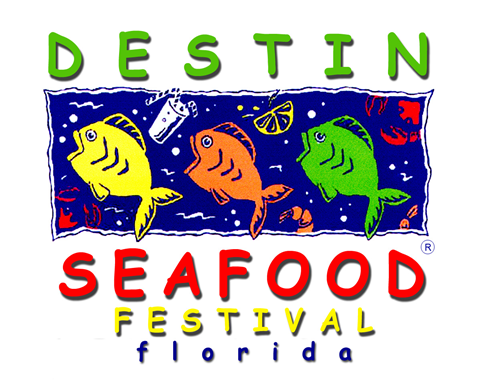 Visit www.destinseafoodfestival.org for festival hours and parking. This entry was posted on September 29, 2014 by 850music in Posts and tagged press release.